Courtesy Asheville and Buncombe County on Flickr. The ongoing standoff at the Malheur National Wildlife Refuge in Oregon reminds me of other breakdowns in law and order. With the fundamental question of private property vs. the federal government, it’s not quite as dramatic as the American Civil War, but it’s a dramatic standoff nonetheless. But the Civil War seems to lurk everywhere I look. The photo above showed up on my Flickr home page today and sent me off to learn about the Shelton Laurel Massacre, in which a Confederate Colonel, Lawrence Allen, from my dad’s home town of Marshall, North Carolina and his lieutenant colonel James A. Keith went hunting for Unionist sympathizers in Shelton Laurel Valley. 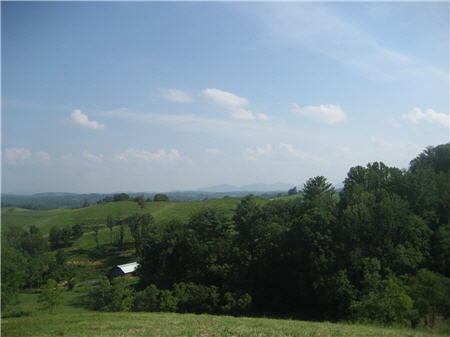 After torturing local women, including the 85 year old Mrs. Unus Riddle, and burning houses and slaughtering livestock, they rounded up fifteen suspected sympathizers, all related and most with the last name Shelton, and began to march them toward East Tennessee where the Confederate army lay. Along the way two escaped, so Keith ordered the remaining thirteen captives shot, including three boys aged 13, 14 and 17. Keith evaded the law after the war but eventually was tried for the massacre after the war in civilian court, and would have been vindicated by the state superior court had he not escaped two days before the verdict was returned; he was never recaptured. Learning about the massacre hits home. 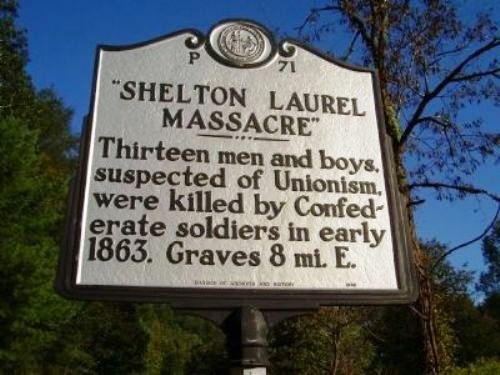 My great-great-grandfather was a Confederate army deserter who only wanted to plow his fields; it’s likely, had he been in Shelton Laurel rather than in the caves in the hills above Marshall, that he would have been rounded up by Keith’s soldiers as well. Some more resources on the massacres: a letter by Col. William R. Shelton giving an oral history perspective on the incident; a 2013 blog post in the New York Times providing some historical and legal perspective on the issue; an essay discussing some of the deep divisions in the mountains; an essay by a novelist and a descendant of a possible participant in the massacre; and a recent article discussing other accounts that cast doubt on Keith’s responsibility for the massacre and suggesting that he may have been framed by Augustus Merrimon, who wrote the report on the massacre for Governor Zebulon Vance. My uncle got a pretty good distinction yesterday–he has his own page in the Special Collections Library website for UNC-Asheville. 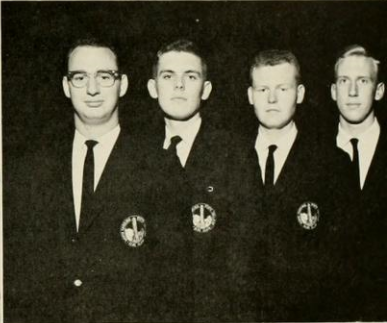 The page hosts oral history information from him about the family, and western North Carolina generally, along with photos. And then there was Obadiah, the great-grandfather. He lived over on the Blowhole Road and the Civil War had come along and he had already married Polly O’Dell and they didn’t have any slaves. Their hearts were not in the War. And the Confederates had already come along and took all their stock – left ‘em one old mare that didn’t have any teeth. And they had to grind the corn to make a crop with. He had a big family of children. Obadiah would desert in the spring of every year and come home to put in a crop. …And Polly would set at the end of the field and act like she was knitting or crocheting, and she would watch while Obadiah plowed the corn and cut the wheat and all. She would wave whatever she was crocheting or sewing on if she saw the Confederates coming to capture him. He’d run for the brush. There was caves in the brush, one big cave still…the reason the road was named Blowhole Road, they called it the Blowhole Cave. I’ve been there many a time. Put milk in it in the summertime, the cool air comes out and we’d be down there fishing. But anyway, he would run for the caves, and get away! But the third time, they knew his tricks, and so they surrounded the field. He took off for the bluff, and there was a Confederate soldier, he had his rifle laying up on the rail fence. He spotted him along and were fixing to kill him. 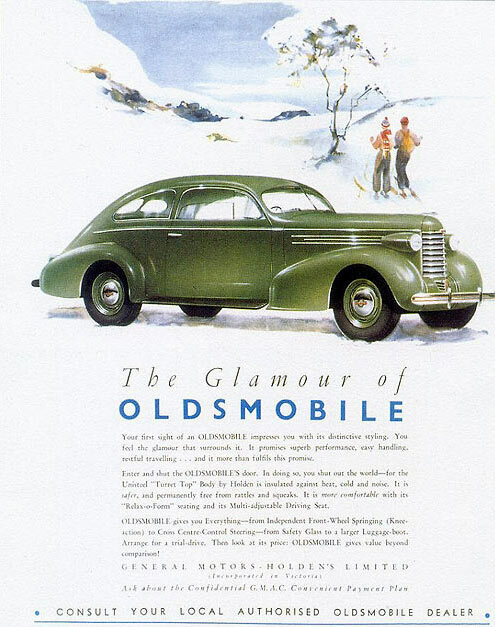 So Obadiah, great-grandpa Obadiah, he threw up his hands and surrendered. They was a whole bunch of western North Carolina boys…the Redmons, and the Paynes, and the Jarretts, and whoever else…the Buckners…and they had all deserted and they had all been captured and they were all in the penitentiary waiting to be shot off their caskets in Raleigh. And they set the Redmon boys up on their caskets and shot ’em off their caskets for desertion. Well, before the 90 days was up, the Civil War looks as it’s going…drawing to a close in the south, and the Confederacy, they see that they are defeated. They put out instructions not to kill anybody else. So, lo and behold, Obadiah is released some little time after that, and in about 12, 13 months, Zebulon B. Vance Jarrett is born. Our grandfather. I took a picture at the entrance to Blowhole Road a few summers ago, and we drove down it once, but without a guide it’s not really possible to find the old cave any more. A shame. At any rate, not only is Uncle Forrest’s oral history now accessible online, but the Asheville Citizen-Times has done a nice feature on him too. I should really just retitle this blog “Tim’s Adventures in Historical Documents.” I keep finding really interesting stuff when I dig. 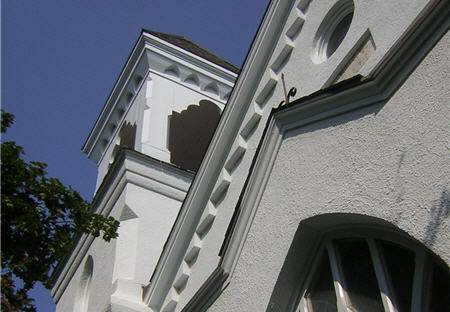 Today’s interesting find is probably only interesting to my Lancaster County family, but here goes: the Leacock Presbyterian Church in Paradise, PA, which was my mother’s family’s church since at least the early part of the 20th century, has a deeper connection to the family than we knew. If you look closely at the photo above, at its maximum resolution on the Flickr page, you’ll see a dedication stone listing the beginning of the building in 1840. The land that Christian and Susanna Hershey sold the trustees for the princely sum of $286.87 became the home of the “new” Leacock Presbyterian Church, the church that my great-grandfather and his family then attended, in which my parents got married, in whose graveyard now resides a fair number of my kin. It gave me a bit of a shiver knowing that my connection to that church goes back even further. I was a little premature with my sketch of the history of the Brackbill Farm two weeks ago. As you’ll recall, the farmhouse says it was built by Abraham and Barbara Hershey in 1857 (or maybe 1867–the sign isn’t very clear in the photo I took from the ground). And I was very excited to find the microfilmed deed books of Lancaster County so that I could start figuring out how it passed from their hands to my great-great grandfather Elam Brackbill. Turns out that just reading the microfilm was akin to sequentially looking at sectors on a hard disk. If there was an organizational structure there, it wasn’t apparent to me–each book was chronologically ordered, but there was no relationship between book numbers. So I couldn’t even find which book had the deeds from the 1896-1897 timeframe that I guessed to be the date of sale of the farm. The Internet to the rescue. The Southern Lancaster County Historical Society photographed the Indexes of Grantors for all those deeds, meaning if you know who sold the property, you can go to the photo pages, read the book number and page, punch them into the online microfilm reader, and read the deed. So I found four or five deeds relating to the estate of Abraham Hershey and his wife Barbara and started reading avidly. And was crestfallen. Each of the deeds conveyed property, to heirs or others through sale, but all of the property was on the wrong side of Rt. 30, in Paradise or Strasburg, or in the townships of Eden and Bart. As near as I can tell, the family property’s mailing address should be in or near Salisbury Township, but so far none of the Abraham Hershey deeds have turned up in Salisbury. So we’re not back to square one, but I still haven’t found the relevant information. It’s frustrating, knowing that it’s somewhere in that massive pile of microfilm and that I simply don’t have the key to find it. Family history: when was it the “Brackbill” farm? I got email yesterday that there was a fair amount of storm damage at the Brackbill Farm in Lancaster County, PA earlier this week. The storm uprooted half a dozen old trees, and sent major chunks of other ash and locust trees flying, with the result that the old cabin and bunkhouse near the creek were heavily damaged. They had stood for over 50 years, so the loss was pretty painful, but fortunately the main buildings and the people on the farm were spared. But it got me thinking. I learned yesterday more of the provenance of the cabin–which great-uncle built it; which of my first-cousins-once-removed helped–than I knew about the provenance of the actual farm. So I had to do some digging. I already knew that the farm had been the home of my great grandfather and his large family, and I had noticed in 2003 the dedication name on the side of the house that said Hershey rather than Brackbill. A few years later I went back and took a better picture, and was able to decipher the stone entirely; it said “Built by Abraham & Barbara Hershey 1857.” That’s interesting, I thought. 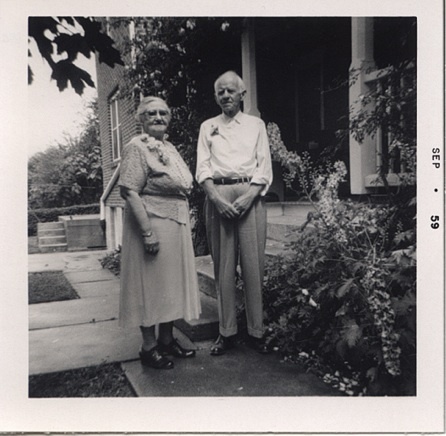 There are plenty of Brackbill/Hershey marriages, but I knew Harry G. Brackbill hadn’t married a Hershey (that’s my great grandparents Harry and Esta above, in front of the farmhouse). So what was the connection? I went back and looked at my genealogy. It seems Abraham Hershey was Harry’s great-uncle–his mother, Barbara Hershey, was the daughter of Christian Hershey, Abraham’s brother. (He was also Harry’s wife Esta’s great-uncle, but that’s a story for another time.) But Abraham had children of his own. How did the farm end up in the Brackbill family? This week I found some clues, finally, in the magnificent MennObits archive of old Mennonite obituaries. There we find obituaries for both Abraham and Barbara, and some pieces start to fall into place. Abraham passed away in 1887 and Barbara in 1904, and Barbara spent the last seven or eight years of her life living with her children. Presumably she would have lived at the farm if it was still in the family, and had the children living with her (it’s a large farmhouse with enough room for large families). So sometime around 1896 or 1897, the farm may have been sold. My mother thinks that it was sold to Harry’s father, Elam, but I haven’t been able to find anything to confirm that. The good news is that the historic deeds of Lancaster County, from the 19th century through 1980, have been made available online. The bad news is that the files are in unindexed images, and there are hundreds of pages of books. So I will find the answer… maybe within the next year. Author Tim JarrettPosted on August 21, 2009 December 1, 2013 Categories FamilyTags brackbill, Family, genealogy3 Comments on Family history: when was it the “Brackbill” farm? I ran across a fabulous collection of old postcards from Lancaster County today–a bygone Lancaster County. Not the real Lancaster County that my distant Mennonite ancestors settled, fleeing persecution; nor the modern Lancaster County Route 30, home of strip malls, outlet malls, and the occasional Amish farm, but something in between. Yes, this is the Lancaster County Route 30 that I remember as a child through the 70s and early 80s–the National Wax Museum, Dutch Wonderland, the motels, the Willows (where my mother worked as a cook in the 1960s), the Dutch Haven. Even Miller’s Smorgasbord. 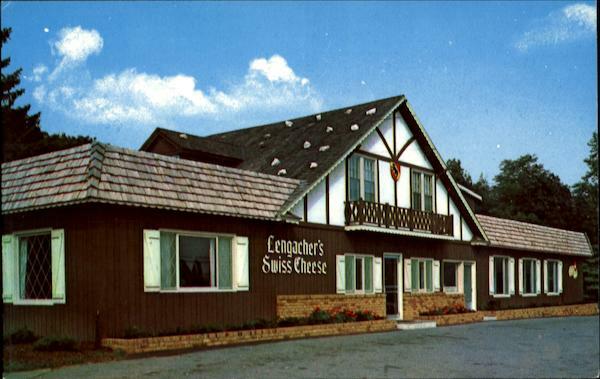 Lengacher’s Swiss Cheese, aka the Cheese House. You drove maybe 10 miles east on Route 30 from Dutch Wonderland, past Paradise, toward Gap, and it was on the top of a small hill on the left hand side. The office was at the left in the back. They made cheese on the right hand side, right behind those windows, in big stainless steel and copper vessels. The center part was the store, where they sold imported European treats (like Ricola–back in the late 70s they weren’t widely available–and Toblerone) alongside local food products like honey in plastic bears, and their cheeses. And I can still remember the cheese. If you’ve ever had locally, freshly made “Swiss” cheese you know how good it can be, and this was outstanding stuff. We would stop at the beginning or end of a visit to my grandparents and stock up, and say hi–and frequently collect my grandmother, who worked behind the counter (I think she ran the register or maybe helped them with bookkeeping–my memory is a little shaky on this score see below). Sometimes during visits she would watch us at the store. I remember napping in the little office on the green couch, and playing with elaborate marble racetrack toys for hours there. The store, alas, closed in the 1990s–Art and Martha Lengacher, the Helvetian founders, having retired around the same time that the cheese production was kiboshed by tighter Pennsylvania food regulations–and both founders are now gone (Martha passed away in 2002, and I don’t know about Art). But the place gave me a deep love for locally produced food and is an important part of my memory of my grandmother. I was thrilled to find the postcard; it’s the only photo I’ve seen of the place as I remember it. Your grandmother worked not only under the Lenachers but also the Laderachs who owned it first. I went to school with their daugher Jane, and had my first pizza in their upstairs home (before they built the home to the west of the shop.) Your grandmother made sandwiches and served truckers and locals who came in for the signature ham and cheese sandwich. No one before or since has made such a big one! The Lenacher’s son, Artie, did try to run the shop for awhile after Art and Martha retired, but soon gave it up. Too bad! The pictures of the Willows bring back many memories. I started there in the summer of 1959 as a dish washer/ pot scrubber, and worked my way up from there… I spent most of my time in the summers of ’60 – ’62 as a salad preparer. Only at the very end of my stay did I get to serve up orders from behind the steam table. Never was I a cook. Mrs. Neuber would have a fit if she heard me called that as she was the cook. Your grandmother was the pastry chef for a time (cannot remember how long). Yes, she did everything. It’s time for the Thanksgiving menu, and not a moment too soon. I managed to get to Wilson Farms today in the nick of time to pick up my turkey, came home early, and boiled my customary Alton Brown brine (1 gallon vegetable broth, a cup of salt, a half-cup mixed brown and white sugar since we were low on brown, and peppercorns) and iced it down and put it on the porch to cool. After cooking a pre-Feast of the Beast (biftek a la Lyonnaise with a quick sauce Robert) and taking care of a few other odds and ends, I wrangled the turkey into the brine. That’s not a small task. We have five adults and a small child at the dinner table this year, which means a slightly bigger turkey. Like, 19 pounds. This year I remembered to fish the neck and liver out of the cavity AND to get the paper bag with the other organs out of the neck cavity (very good progress!) before the turkey went into the cooler on a bag’s worth of ice, breast down; the brine went over the turkey; and another half bag of ice went on top. The cooler is now on the porch (mercifully, it’ll be between 30° and 34° tonight) and I’m catching my breath while I think about the rest of the menu. What’s up with all the duplications? Well, I made the classic product manager error: I didn’t socialize my plans in advance and got blowback. We’ll see how it goes. Ever have one of those vacations where it seems like you spent most of the time in the car? It took us forever to get to New Jersey and Lisa’s folks on Friday night, thanks in part to a two hour backup on the Tappan Zee Bridge. I think every now and then about that Paul Simon song that goes, “I believe in the future I may live in my car.” Thank goodness for rising gas prices; they’re the only thing standing in the way of that particular future. We spent time on Saturday at the Jersey Shore (at Island Beach State Park) and I was reminded of why I really like the beach. I love Crane Beach but for various logistical reasons I’ve been less than thrilled the last few times I’ve gone. Plus, the gentle surf, pristine sand, and clear waters are all nice, but they don’t spell beach to me. I grew up near Virginia Beach and that, jellyfish and all, is the beach I enjoy. Island Beach had a lot of that–the rough surf, the cool but not frigid water, the feeling of being buffeted about by something larger than you. All aces in my book. Sunday was a marathon trip over to Lancaster County, where we arrived at Leacock Presbyterian Church with ten minutes for me to go over the music for the service. We’ve had a tradition for the last few years (spearheaded by my cousin Don Brackbill) that the men of the Brackbill clan get a men’s chorus going on the Sunday of the Brackbill picnic, and we had a pretty good turnout this year although a few voices were missed. The picnic itself, over at the Brackbill farm, was gorgeous–not too humid but warm, and the usual crowd of aunts and uncles, cousins, second cousins, first cousins once removed, and dogs. I missed my grandfather and my uncle Harold, and my aunt Marie. But my cousin Catherine was there with her family, and it was nice to see them–they haven’t been to a reunion for a while. I’ll post pictures when I get them off my computer and phone; in the meantime, I have a few from 2003, 2005 and 2006 online (though not 2007, when it rained like crazy). I’m heading south this afternoon. We’ll stay a day or two with Lisa’s parents, then head to Lancaster on Sunday for the family reunion. 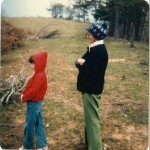 This will be the first Brackbill reunion since my grandfather and aunt passed away. It feels odd to be heading back to Lancaster, a little like one of my feet has come unglued from gravity and I might float away. At least the weather is going to be nice. It poured last year, which was a little bit of a bummer. And being down on the family farm, where my grandfather grew up and where his grandnephew still lives, is going to be nice in the August heat. I miss that honest humidity of the mid-Atlantic from time to time. I tried to capture it in photos back in 2006, but I think I didn’t succeed in doing it justice. … to write anything halfway intelligent, so you get this instead. But Estaminet has been writing a fair bit; check out her travel journals from her Oregon trip. She’s back staying with us, and our parents come in late tonight, so it’ll be a fun full house. This is, of course, the other reason I’m not writing so much–lots of stuff to take care of before I pick them up from the airport. And I’ll be checking out the temporary James Hook lobster shack this weekend to see if they’ve been able to resume any level of retail operations. It would be great to get some in time for my dad’s birthday.